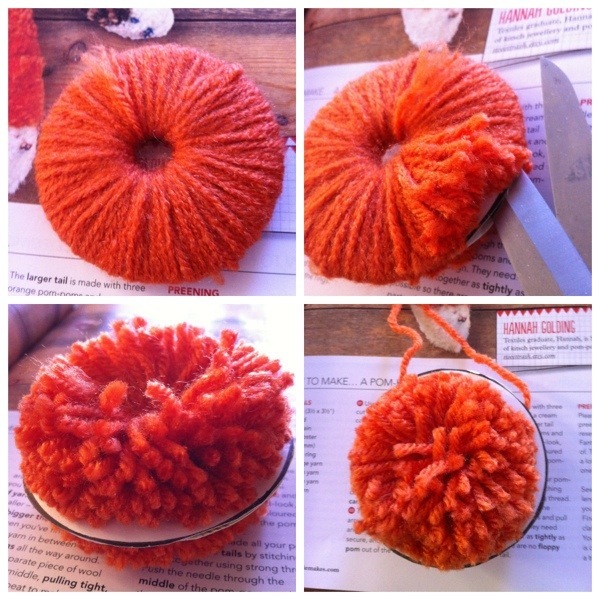 Pom poms, I made them endlessly at my Grandma’s house. Whenever we visited, I would be digging around in her knitting box to see what wool she had. I liked the remnants of part used balls of wool, some was the crinkly wool which comes from pulled down woollies. Another job I loved to help her with, I would wind the the wool around my hands off the woolly item, then Grandma would wind it from me into a nest ball of wool. Then I would make pom pom after pom pom! 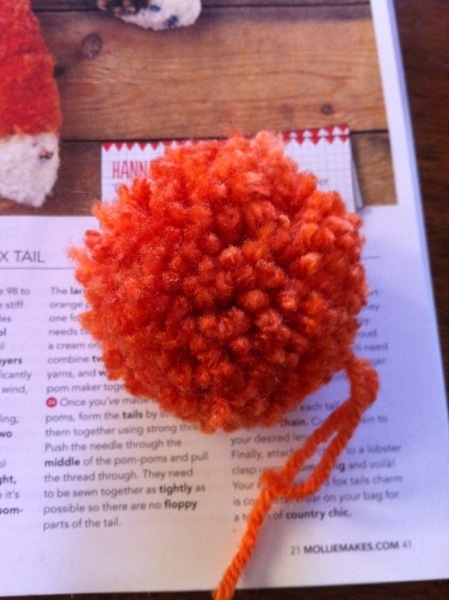 Now I have made a few pom poms, I want to pay the Upcycle Exchange a visit to explore the fabulous yarn range within! 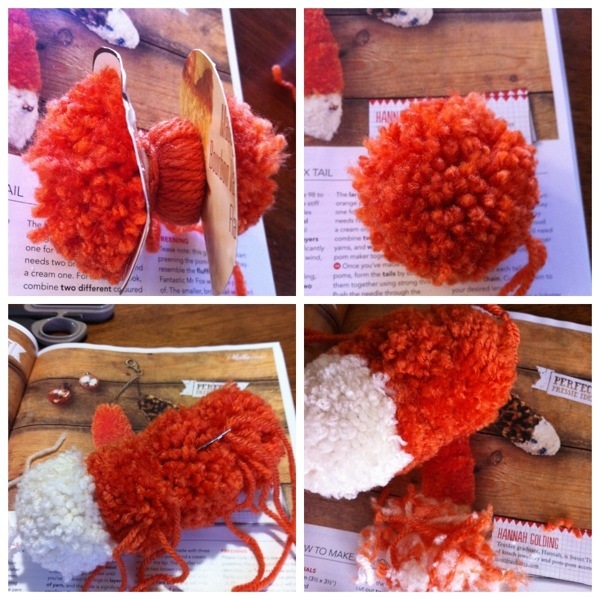 So, when I found an article in the new Mollie Makes by Hannah Golding with instructions on making a fox tail, or any fluffy animal tail, from pom poms, I was in. First I had to find an old cardboard box, a cereal box is about right. Draw two circles with holes at the centre and cut them out. I cut a length of wool as long as I could work with (longer the better without driving yourself mad with it). Wrap wrap wrap around the cardboard. 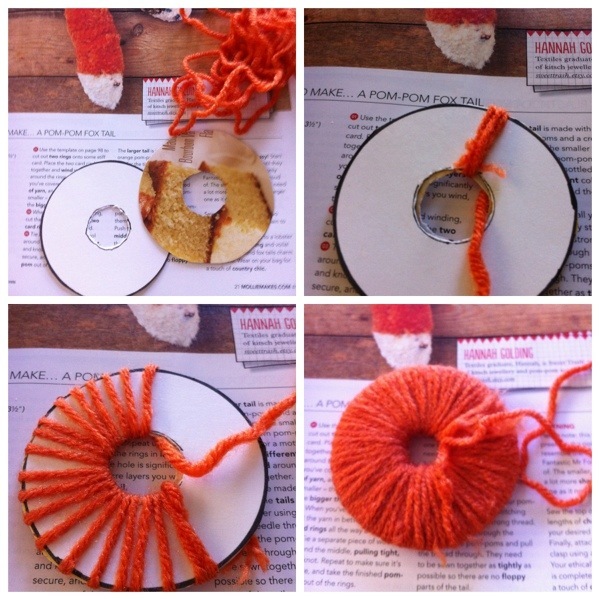 Add new wool as needed, no need to tie a knot, just lay it on and carry on wrapping. The hole will be about half the size when there is enough wool wrapped. Next to get some lovely sharp scissors and cut between the cardboard rings at the outside and cut all the wool around the edge. Grab a length of wool and wrap it between the cardboard, pull it tight and tie a few knots to secure. Time to carefully remove the rings, you can rip them right off, but only if you want to cut out more circles with little holes in the middle. 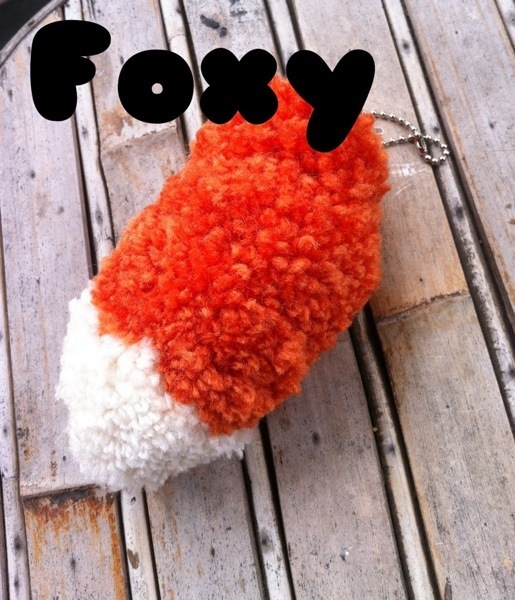 For the foxy tail, you need 3 orangey foxy coloured pom poms and one cream, all the same size. Now a long sharp, big holed needle like a tapestry needle is used to sew the 4 pom poms together, nice and tight, but in a nice row, tail like. Now the fun and messy part, the trimming of the tail. A visit to the tail salon for a nice shaping trim. I tied a ball chain on to hang my lucky foxy tail.